Photograph of Fitzmaurice Street, Wagga Wagga, taken from the top of the sandhill outside Victoria House and the Court House. 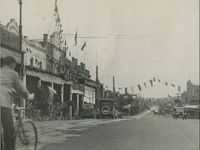 The street is decorated with flags and bunting in celebration of an unknown event. 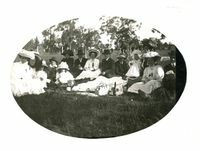 Photograph of seven men and seventeen horses apparently taken on "Blakeleigh" at The Rock (possibly off Payne's Road).